What is the CELL Function? The CELL function is an Information function,FunctionsList of the most important Excel functions for financial analysts. This cheat sheet covers 100s of functions that are critical to know as an Excel analyst that will extract information about a cells location, contents or formatting. The CELL function takes two arguments, one that determines the type of information to be extracted, and the other is which cell it will be checking. As a financial analystFinancial Analyst Job DescriptionSee a real Financial Analyst Job Description including all the skills, experience, and education required to be the successful candidate for the job. Perform financial forecasting, reporting, and operational metrics tracking, analyze financial data, create financial models, the CELL function is useful as it can help verify if a cell contains a numeric value instead of text before we perform a calculation on it. If we import data from an external source, we can verify that all cells with numbers are used for calculations. Address It will return the address of the first cell in a reference as text. Col It will return the column number of the first cell in a reference. Color It will return the value 1 if the first cell in a reference is formatted using color for negative values, or zero if not. Contents It will return the value of the upper-left cell in a reference. Formulas are not returned. Instead, the result of the formula is returned. Filename It will return the file name and full path as text. If the worksheet that contains reference has not yet been saved, an empty string is returned. Format It will return a code that corresponds to the number format of the cell. Parentheses It will return 1 if the first cell in the reference is formatted with parentheses and 0 if not. 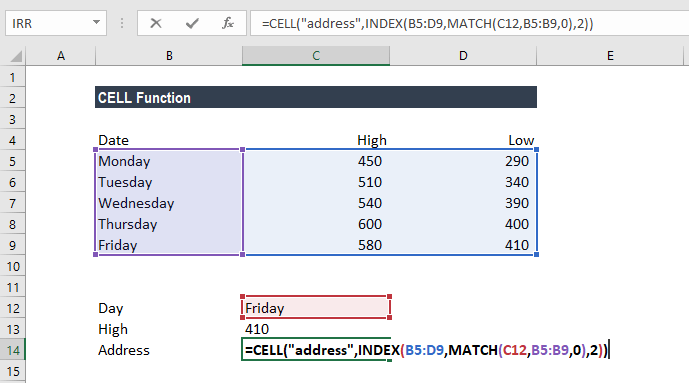 Prefix It will return a text value corresponding to the 'label prefix' of the cell. Protect It will return 1 if the cell is locked, otherwise, 0. Row It will return the row number of a cell. Type It will return a text value corresponding to the type of data in the cell. It can either be "b" for blank (or empty); "l" for label (i.e. text constant), or "v" for value (for any other data type). Width It will return the column’s width. Reference (optional argument) – It is the cell with the information to be returned for. If a range of cells is supplied, the returned information relates to the top left cell of the range. If the reference is omitted, the returned information relates to the last cell that was changed. 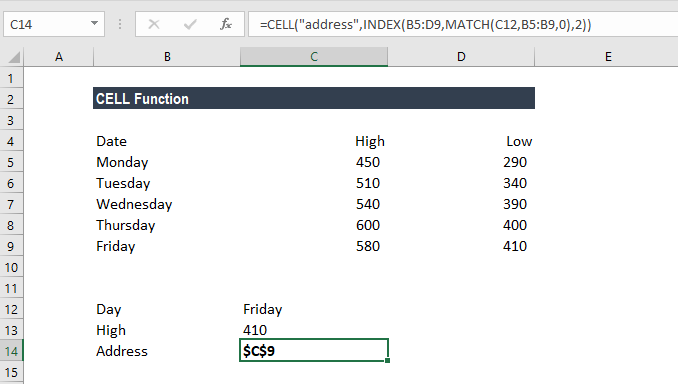 How to use the CELL function in Excel? Suppose we are given the following data on stock price highs and lows. To get the address of a lookup result obtained with the INDEX function, we can use the CELL function. The INDEX function will display the value of a cell at a given index, but the function underneath it actually returns a reference. So, by wrapping INDEX into the ADDRESS function, we can see the address of the cell returned by the lookup. #VALUE! error – Occurs when the given info_type argument is not one of the recognized types.